Admittedly, no matter which one of the condominiums for sale in Quezon City you buy, chances are your new home will have a smaller kitchen than that of a regular house. If you are a person who love to create new dishes as if you’re a part of a wedding catering company, the storage may be a bit of a problem for you. Luckily, there are some ways to maximize the space you have. Here are some tiny kitchen storage hacks you can surely use. For such slim instruments, the storage for knives can really take up a fairly large amount of space on the kitchen counter. If you are still using metal knives, you can easily solve this problem by switching that huge block with a magnetic strip. Simply install a magnetic strip with at least an inch in width on your kitchen wall— et voila, easy and less space consuming storage for those sharp instruments! One of the hardest things to store are pot lids. For ages, women across the world have been trying to figure out how to put away these covers without fear of damaging them. Here's the solution: a towel rack. Yes, you heard that right, a towel rack. Install it anywhere you want with its mounts, like the inside of your cabinet or on the wall and you'll have an easy lid holder. Your refrigerator can be one of your best friends when it comes to storage. Thanks to its magnetic surface, it can serve multiple purposes and not just a modern day appliance to keep your food cool. Turn it into a spice rack with some jars and magnets. If you have some baby food jars lying around, clean them then transfer your spices into those jars. Stick a magnet on their surface and there you have it, a magnetic spice rack! Oh, and don't forget to label the jars with the spice they contain. It's sad to see some vacant wall space in your kitchen that you know you can truly use if you only knew how. Worry no more, because here's the solution: a multipurpose pegboard. Purchase a painted one and hang it on a vacant wall. Place a few S-hooks or a rack on it and there you go, a multipurpose pegboard. You can use it not just for storage purposes, but for drying kitchen instruments as well. 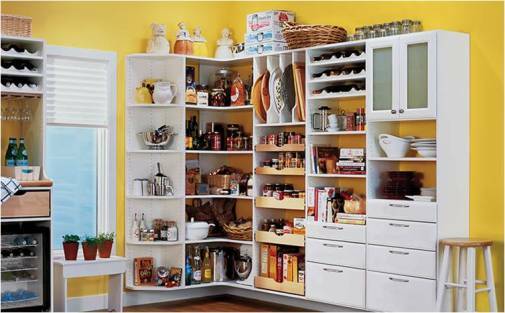 If you have a lot of space above your kitchen counter and would not like to undergo the hassle of installing cupboards, then shelves are your best solutions. Put on the first shelf your most used cookware and on the top, place your special occasion pots and pans or the ones you rarely use. Shelves are quite handy as not only are they easy to clean, but they can be adjustable too if that's the type you bought. To cook, one needs ingredients and in a tiny kitchen, there's hardly any space for it— that is, if you don't account the tiny space between your refrigerator and your wall. Create a rolling, skinny shelf and you'll have tons of storage for all your canned, bottled and jarred ingredients. Storage can be a bit of an issue when it comes to a condo, but with some ingenuity you can surely maximize every bit of extra space for your use.